Need an emergency dentist in Seguin or San Marcos for kids? Call and ask about Early Bird Appointments at Alligator Dental! No Appointment needed. Simply walk in during Early Bird hours and let receptionist know child is here for an Early Bird Appointment. Parent will fill out a short questionnaire and child will be seen asap! Going to the dentist is fun when you go to Alligator Dental! We pack our offices with kid-friendly activities to help each child enjoy their time at the dentist. There is so much fun they don’t want to leave! Our doctors and staff specialize in pediatric dentistry. They are experts at working with children and explaining things at age-appropriate levels to help with patient’s understanding and comfort. Check us out! 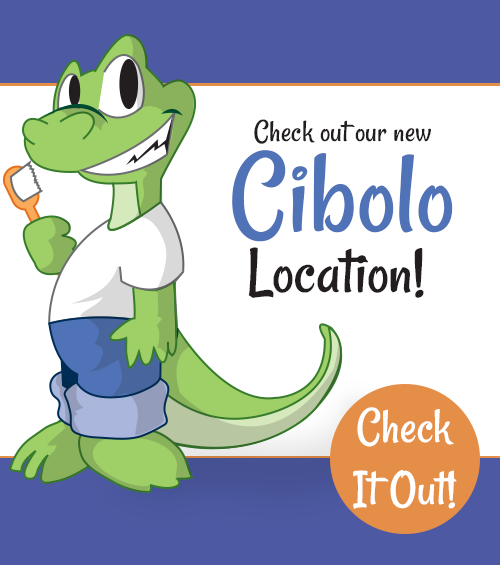 Alligator Dental is the premier dentist in Seguin and San Marcos, Texas for kids. We strive to make your child’s visit to the dentist as fun and enjoyable as possible, while providing exceptional dental services. We understand there is a lot to know about oral hygiene and keeping little teeth healthy. Don’t be overwhelmed! Take a look at our Patient Care section for valuable information. Each patient is given a private consultation before his or her first appointment so we can get to know you and explain a personal care timeline. Alligator Dental is your number one kid’s dentist in Seguin, San Marcos, Cibolo, New Braunfels, Kyle, Gonzales, and all of the surrounding communities. Nothing touches our Gator hearts more than hearing that our patients had a great experience at Alligator Dental! We welcome your feedback! Our bright, colorful, and kid-friendly atmosphere is designed to keep both you and your child entertained during the appointment. Contact us today to get started!